The American Center is a high-rise tower in the Metro Detroit suburb of Southfield, Michigan. It was built in 1975 and stands at 26 stories, with one basement level, for a total of 27 floors. 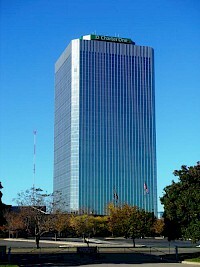 The building's main use is that of a typical office tower. It also includes a parking garage and retail spaces. As with many modern architecture-based towers, it exterior is laden with golden glass. 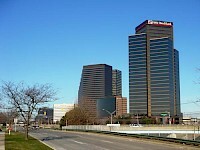 The Southfield Town Center is a cluster of five golden interconnected skyscrapers forming a contemporary 2,200,000 square feet (204,400 m), office complex which includes a Westin Hotel, restaurants, a fitness center, and a major conference center for up to 1,000 attendees. This office-hotel complex is situated along Town Center Drive off the John C.